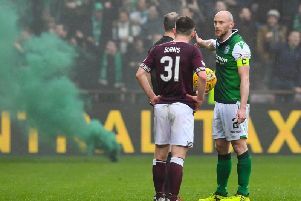 Michael Appleton has emerged as the frontrunner for the Hibs head coach role as the club closes in on appointing a successor to Neil Lennon. The 43-year-old has had spells at the helm of Portsmouth, Blackpool, Blackburn and Oxford United but it was his 178-game stint at the Kassam Stadium where he enjoyed the most success, winning promotion to League One with the U’s and taking them to the EFL Trophy final in consecutive years. Oxford fans have fond memories of his time in charge, and have been giving their thoughts on Oxford fans’ forum yellowsforum.co.uk. One fan wrote: “His football is the best we’ve had in about 30 years. “He is a very good manager and good with the youth - we were trusted with a few youngsters such as Jonjoe Kenny [now Everton’s second choice right-back] and he also developed [Leeds United forward] Kemar Roofe into a top striker. “His football is beautiful to watch. Ball on ground and fast football - it was like watching Brazil at times. Pete Burrett added: “His initial record at Oxford was uninspiring, but thank goodness the club stuck with him. Many fans, including me, wanted him gone after a couple of months of the season. Gary Baldi offered: “[Appleton] had a hard start at Oxford for various reasons, but worked hard and used his connections well to bring in young players, getting us promoted playing good football. Another Oxford supporter suggested that Appleton shouldn’t be judged on his time at Portsmouth, Blackpool and Blackburn - “a series of basket-case clubs”. They continued: “[At Oxford] he initially tried something impossible with players that weren’t capable. Lower-league veterans trying to play tika-taka was a bleak watch and only when given the cheque book and an opportunity to clear a lot of players out did we start to see what he was capable of. We excelled after that and he gave us some great cup runs, Wembley appearances and a coveted promotion. “He’s a head coach, not a manager as such. He invests his time in the coaching and relies on [others] for scouting. As such, Oxford built a reputation as a means of developing young talent and playing good football. “He needs time to build his empire. Give him that and a team of scouts to work with and he’ll change Hibs from top to bottom. “If your side is winning 2-0 under Appleton they won’t sit back and take the 2-0 - they’ll keep going for more goals. The best manager I’ve ever seen at Oxford by a million miles. Fast, attacking passing football, even when you lose a game it will still be the best football you’ve ever seen,” offered another fan.